Education Loan Task Force (ELTF) has submitted 4 Pre-Budget recommendations to Ministry of Finance for their consideration on 3rd January 2017. This has been acknowledged by the Office of Minister of State (Finance). The following recommendations have been submitted by ELTF to the Government of India. This is the text of the letter sent to Ministry. On behalf of Educational Loan Task Force (an initiative of emagazine PreSense), we suggest the following for consideration while finalizing the Budget for FY2017-18. 1. 1. Banks are not implementing properly the Education Loan Scheme formulated by IBA. ELTF has been taking up this issue time and again. Since the Banks have more liquidity after demonetisation, the Government of India may advise all the banks to be more liberal and give priority in sanctioning Education Loans to poor students to pursue higher studies. 2. 2. Rate of Interest charged by the Banks are very high. Government of India MHRD provides 'Interest Subsidy' to the students who pursue professional and technical courses during study period plus one year. Though the Government of India promises 100% reimbursement, in reality, only around 25% to 30% are given to students. ELTF suggests that (a) more funds should be allotted to provide 100% interest subsidy during the eligible period. (b) Also, in addition to professional and technical courses, the poor students who pursue other courses, including diploma courses may be given interest subsidy. 3. 3. 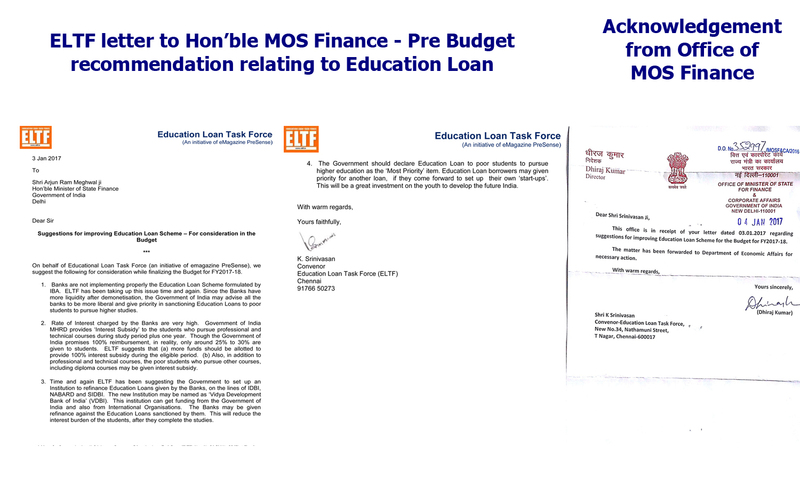 Time and again ELTF has been suggesting the Government to set up an Institution to refinance Education Loans given by the Banks, on the lines of IDBI, NABARD and SIDBI. The new Institution may be named as 'Vidya Development Bank of India' (VDBI). This institution can get funding from the Government of India and also from International Organisations. The Banks may be given refinance against the Education Loans sanctioned by them. This will reduce the interest burden of the students, after they complete the studies. 4. 4. The Government should declare Education Loan to poor students to pursue higher education as the 'Most Priority' item. Education Loan borrowers may given priority for another loan, if they come forward to set up their own 'start-ups'. This will be a great investment on the youth to develop the future India.